Perhaps the Germans have a word for the specific joy of tricking computers in pursuit of free fast food. It’s a combination of gaming the system, reveling in the absurd, and enjoying a tasty burger. It’s likely 40-characters long. Whatever that word is, we would apply it to this video, posted by an Australian man who’s figured out how to score a free hamburger at McDonald’s via the chain’s self-serve ordering kiosk. The video has racked up more than a million YouTube views in a single day. 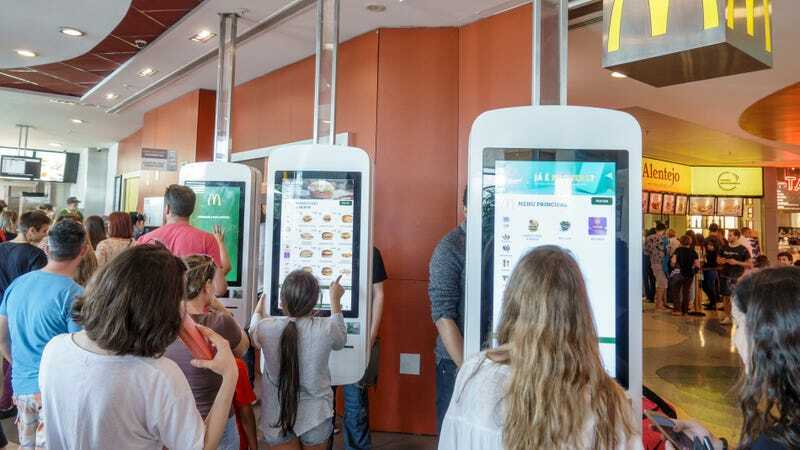 In it, the man and his friend visit Macca’s—the Australian term for McDonald’s—and use the kiosk to order 10 burgers that each cost $1. The pair then customizes them by removing the beef patty, which reduces each burger’s cost by $1.10. Essentially they’re credited $1, which they then apply to an eleventh $1 burger. As the pair completes the ordering process, the glee in the narrator’s voice is palpable. Presumably they’ve tested this method before, but it seems every time you trick the McDonald’s kiosk feels like the first time you tricked the McDonald’s kiosk. It’s not certain whether this could work at McDonald’s in the U.S., or whether Australian locations have since closed the loophole that allows this to happen. Either way, I never would have thought up such an ingenious hack, and I applaud the two Aussies for their creativity. I do think that “Macca’s” still sounds weird, and that if you’re going to post a video that you hope goes viral, you should rotate the camera to film horizontally.